Live Jazz - piano and bass. Semi-private room for parties up to 20. *****Please accept our apologies on behalf of The Prime Rib. Reservations are not available from 8/31/2018 - 9/3/2018 at this restaurant. Reservation will be available starting Sept 4th 2018. Thanks. ***** Consistently Zagat's #1 Rated Steakhouse in DC. The Prime Rib features USDA Prime Dry Aged NY Strip Steaks&USDA Filet Mignon. One of DC's best kept secrets is their award winning seafood, such as Jumbo Lump Crabcakes and Imperial Crab. 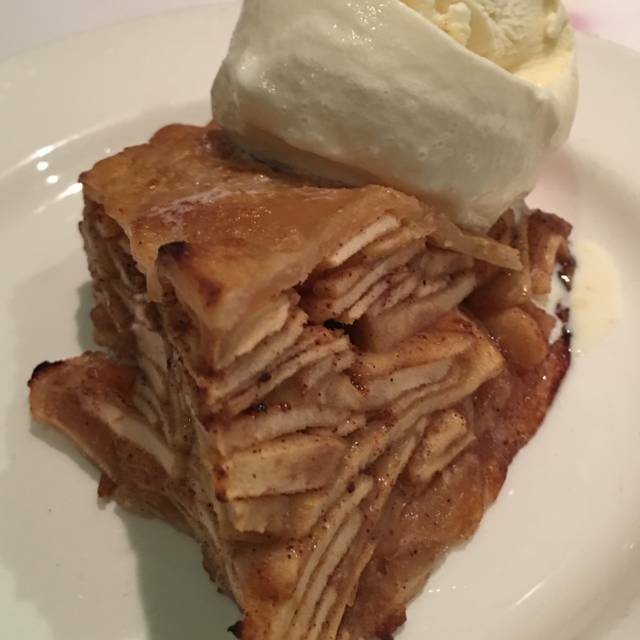 Jackets after 5:00 pm , complimentary valet parking, live piano music nightly. Casual dress at lunch. I was introducing a current student of mine, from South Carolina, to my favorite restaurant in DC. He has been accepted for admission to my Alma Mater, Howard University, and while he and his parents were touring the campus I wanted them to have the best steakhouse experience in the area. They concurred with me, it was. I visited the restaurant with my family, wife and my daughters of 7 and 12 years. 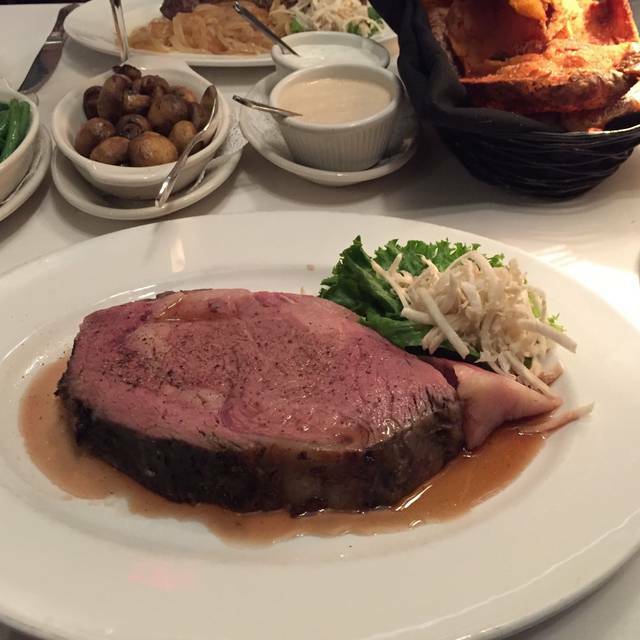 The service exceeded my expectations and the best came with the prime rib...Delicious. They take care about the cocking term. It really was a professional and very friendly service, in addition to the quality of the dishes, at 7PM he started playing a jazz duo, which gave the touch of elegance and ambience. absolutely recommendable, a restaurant that should be on your list of places to visit. 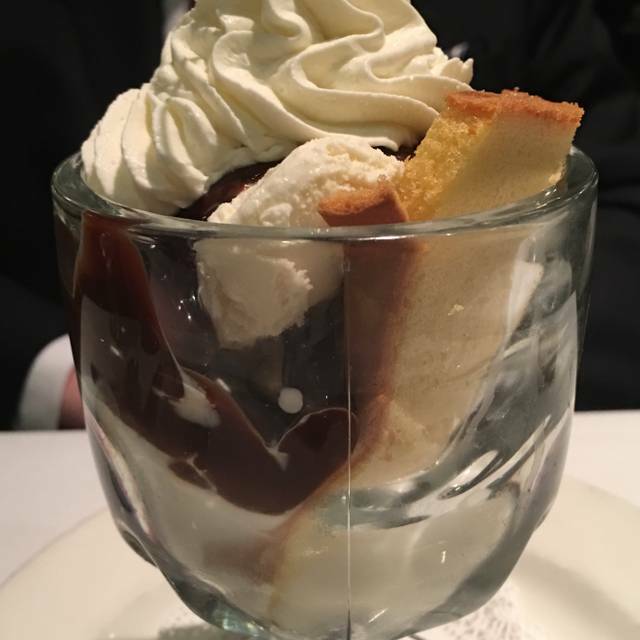 We went to The Prime Rib with high expectations and were sorely disappointed. This establishment requires men to wear a jacket which I didn’t travel with from CA. They provide jackets for this purpose but after trying on at least 6, found one that some what fit, but still too small. Normally, I wouldn’t have minded this expertise, but the restaurant was was very warm and stuffy, making for an uncomfortable experience. My Wife and I ordered the Prime Rib can honestly say that I haven’t had such a dry, tasteless, unseasoned, piece of beef in a long time. Keep in mind, The Prime Rib is an expensive restaurant and we much more based on reputation and reviews. The baked potato was as dried out as the Prime Rib and the green beans were cold. It would have been nice to bring this to the servers attention if only he had returned in a timely manner to address all these issues. There are way too many great restaurants in DC and strongly suggest people go elsewhere for a better dining experience. We will be back in DC but we will not be dining a The Prime Rib. 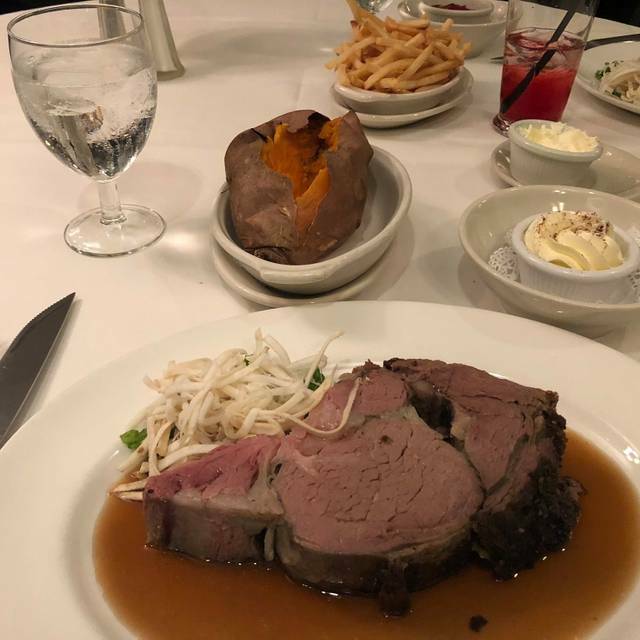 The quality of food at Prime Rib is something that one can count on. 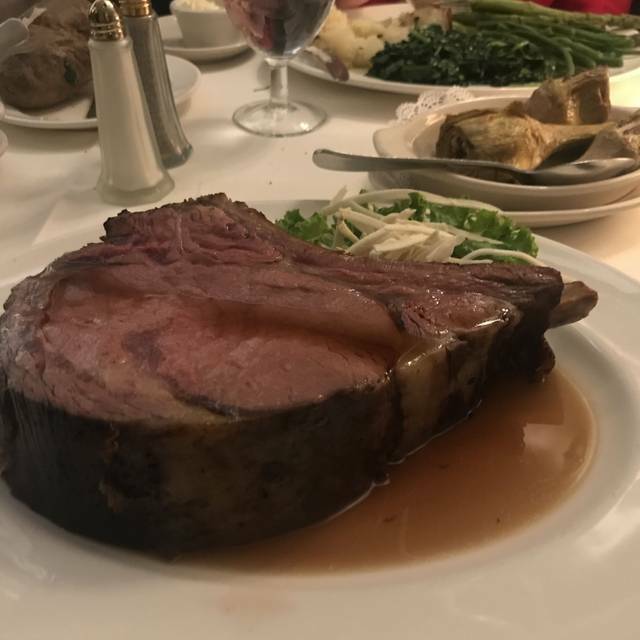 Amongst us we had prime rib--one rare, one medium well, and both perfectly cooked; a chopped steak, that our guest said was excellent; and several vegetable dishes. What was different this time from the many times we have eaten at this restaurant previously was the service: it was slow. The restaurant seemed very full when we arrived (less so when we left) and, perhaps, the kitchen was overwhelmed. However, it was 15-20 minutes before we were given a menu (we had to request one), and a good half hour before we were given bread. Also, there was one very odd gesture: We were celebrating someone's birthday. I'd noted that when I made the reservation and made it quite clear during dinner who the celebrant was. She did not order a dessert. I guess it was in an effort to honor the birthday girl that she was served someone else's dessert with a candle in it. That created an awkward situation where she had to blow on someone else's dessert. There would have been better solutions. Old style steak house. Service was excellent. The prime rib and all the trimmings were fantastic. The only downside was the place was very noisy. Other than that, the overall experience was fantastic. David Gough was our head waiter. He treated us like royalty!!! He was wonderful! And the food was amazing! Thank you for such a wonderful experience! 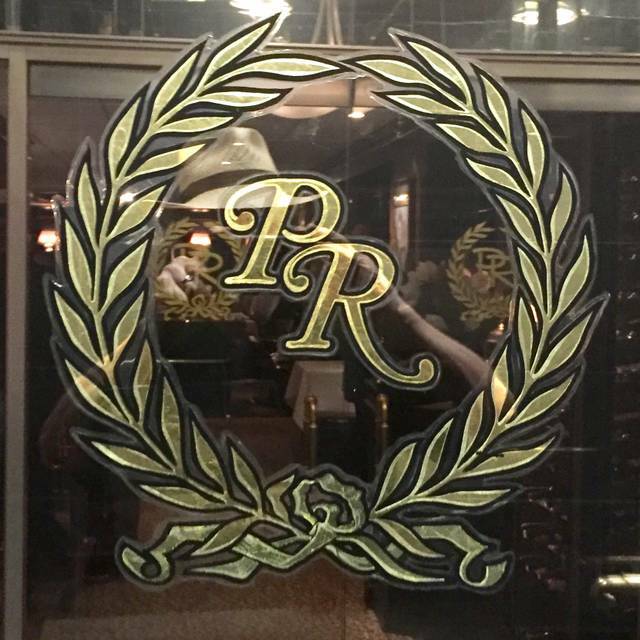 I Loved the Prime Rib Restaurant, the food was top of the line and impeccable service by server8-Velasquez. I am glad to have celebrated my birthday there and want to thank everyone including the very nice water guy. This is a diamond in a city that has many restaurants but none like this one. Kudos to the musicians-very nice music guys. This restaurant has a lot of hype behind it, which makes it hard to live up to one's expectations. That being said, they lived up to everything we had heard. The wine, food, service, ambiance, and music were all first rate. We'll be back. Very nice old world steakhouse. A place to see and to be seen. Fitz the bartender was a good ole boy w a bonding voice and great personality. Makes a mean gin martini. Cocktails very generous. Good oysters, salad and excellent prime rib. Would do that again! Spent our wedding anniversary here. Food and service quite good. Decor a bit outdated. Understand the decor but could use some updating-heavy and drab. Dined on Sat night and had piano with base player-lovely touch and added quite a bit to the evening. Will definitely be back. Great restaurant. Terrific food. Excellent service. Very upscale atmosphere. One of our favorite restaurants. Out of many great steak restaurants in DC, The Prime Rib is my favorite. Great, old school restaurant with attentive and entertaining wait staff; excellent steaks and seafood; and, a wonderful wine list. Oh, and I should mention the bartenders sling some great cocktails. Finally, live piano every night that doesn't overpower. The ultimate endorsement: lots of regulars...'nuf said! This was a sentimental journey to a place I went with my dad decades ago. It was a perfect evening, reliving old memories and creating new ones. The spirits menu have in accuracies, there is no glenlivet 18 despite it being in the menu. They don’t list the tequilas, and couldn’t tell the difference between a Blanco or Anejo... sounds top notch right? Macallan 25 was a good price so we had one of those. We ordered the escargot, sautéed spinach, potatoes au gratin, ny strip au poivre, and the inedible tuna steak. I had two bites and couldn’t eat it. They didn’t offer me anything else, barely apologized , they did take it off the bill. But rightly so. The spinach as overly salted, and the Au gratin wasn’t thinly sliced potatoes its chunks of potato with cheese thrown in top. Save yourself a horrendous experience.. go to one of DC’s actually good restaurants. Three of us were meeting a fourth for dinner. The lady meeting us was traveling from Maryland, arrived first, and was seated at the bar until our arrival. We arrived on time, and she was not informed that we were there. We waited for one half hour before calling her, and found that she had arrived first and was in the restaurant the entire time. She was quite upset that she was not told her her party had arrived. This was a snafu that should not have occurred. 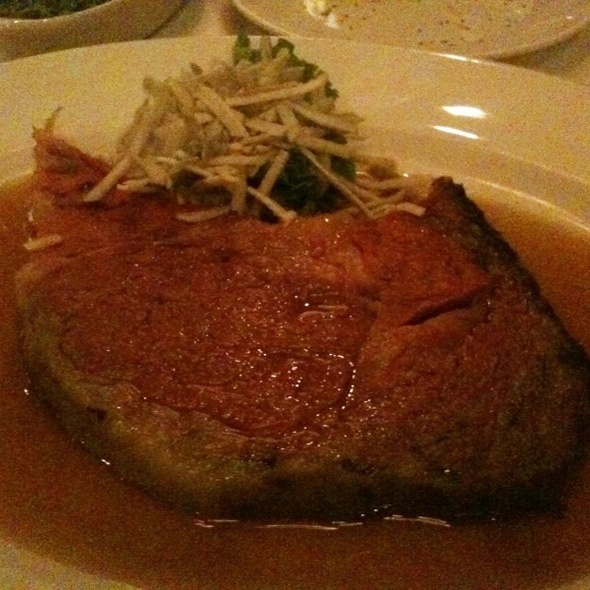 The Prime Rib has always been known for great food and good service. The food measured up, as did the table service. But not informing our fourth diner promptly when we arrived was very annoying to everyone and certainly diminished our enjoyment of dinner and the evening. Elegant fine dining especially suitable for special occasions and serious business dinners. Superb ingredients with expert preparation for all dishes we selected including lobster bisque, crab cake, veal chop, special steak, au gratin potatoes, green beans and dessert. Highly recommended. Best in town !! Want to feel what a Real Restaurant is Eat at the Rib!! Always a great time at Prime Rib. It's a civilized place to have a steak (I love the prime rib), a martini and a glass of wine. Bartenders are real pros, too. Amazing food with great service. This restaurant provided excellent service, and the food was absolutely perfect. Excellent in every way. Our waiter was personable and provided outstanding service. A bit pricey, but a great experience overall. Upon arrival, I noticed an unwanted smell in the restaurant. It seemed like a damp and sour smell. I was hoping to smell delicious food, so I was surprised by the smell I was treated with. The food was great as was the service. Pianist was wonderful. I hadn’t been in many years and was excited to host my friend there for her 70th birthday. Took my boyfriend here for his 65th birthday and it was all I’d hoped it would be. Intimate setting with piano music, an attentive waiter, great food, nice bottle of wine. 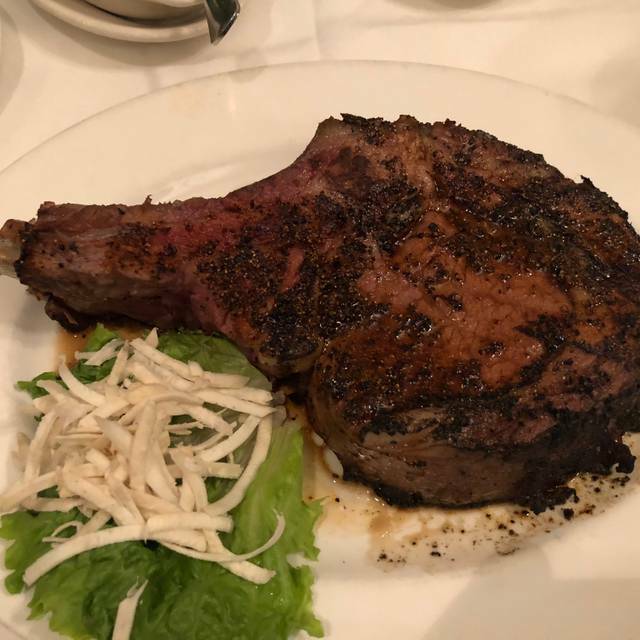 I had the signature prime rib and he had the full cut—both delicious and impressive. Loved the potato skins side. The creme brûlée with happy birthday song was a nice touch. A great memory! We lived in DC until about 15 years ago and were frequent patrons of The Prime Rib. Had not been since, so when a family reunion brought us back to town we made a point of dining here. After a prolonged absence so many restaurants are either no longer in business or have dropped their standards (decor, clientele and/or quality of the kitchen). We were very much hoping The Prime Rib was not going to be a disappointment. Thank God, it was not!! Every aspect of the restaurant was perfection, just as we remembered it. It is an oasis in the middle of the mediocrity (or worse) which constitutes so-called society today. Please, please maintain your standards forever; catering to the informal and casual which pervades society is a huge mistake. There are still many of us who revere style and elegance. The decor of this restaurant needs an update...VERY tired. My opinion...considering the prices, the value is not there. Nice feature, having the piano player. It is a very elegant steakhouse. We love the music the food and the exceptional service. We had. It been here in over 25 years, but the experience was every bit as fine as we remembered it. We were hosting out of town guests, and they loved it! It is a real throwback to the glamour and glitz of yesteryear. Classic steakhouse menu favorites with professional table service are the standards here. The superb live music was the “cherry on top” of this wonderful evening. 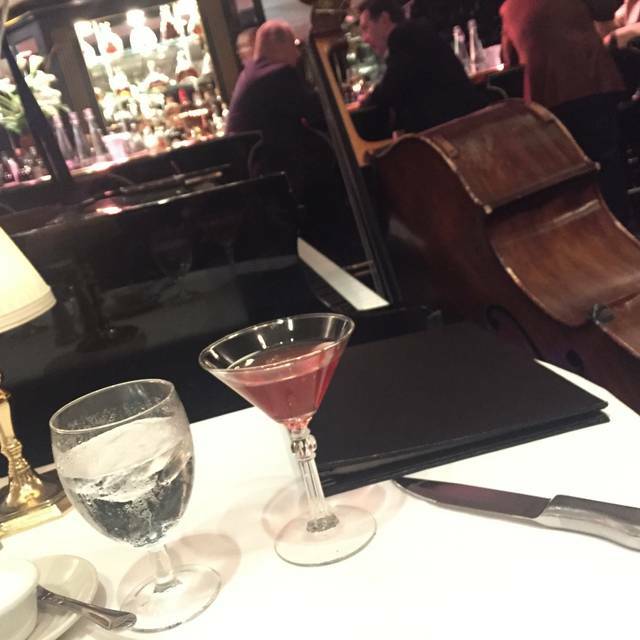 Consistently excellent food, drinks, and service in a beautiful, special environment - with great piano music as well. Classic old school great atmosphere service impeccable food wow- I will not eat prime rib in this country until I return. It was such a pleasure to dine at a restaurant where one could hear each other speak. The service was wonderful as was the ambience. It was a birthday dinner for my dear friend and he felt very pampered and special. Excellent service, friendly atmosphere. Food was very good. We always enjoy special date nights here. My husband ordered a beautiful lobster, which he really enjoyed I had the Dover Sole almandine; it was good. Ambiance is exceptional.